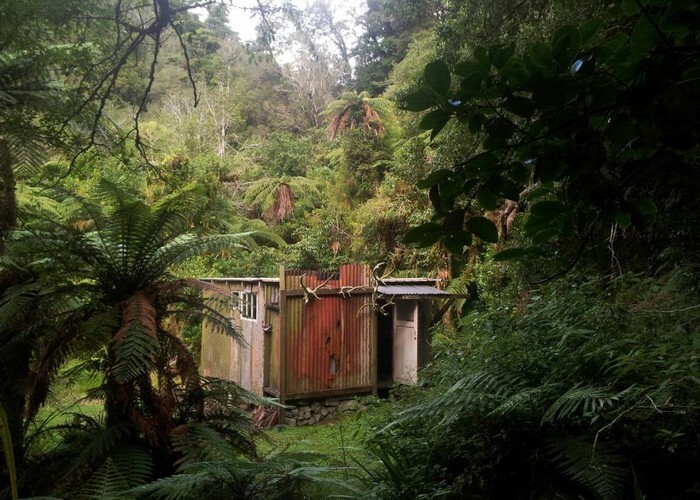 Snowy Hut (aka Snowy River Hut): An unmarked hut in the Tararuas. Used mainly by hunters, though also a few trampers and also DoC workers - so DoC clearly know the hut is there. However the hut is not listed in DOC's hut list or referred to in any DoC publications. Spacious, with 3 bunks and an open fire. Sink, but water is from the river. No toilet - but a spade is provided and thankfully people seem to use it. Hut is in reasonable condition considering it presumably receives no official maintenance. Located on the southern bank of the Eastern Waiotauro (Snowy River). The helipad is quite easy to spot amid tall grass on river flats, but the hut is well hidden. Access up the river is fairly easy in normal flows with one deep pool about waist deep. Snowy Hut a.k.a Snowy River Hut • By madpom. Licence: cc by. Usual access is up the Snowy from Otaki Forks. An overgrown 4wd track leads from a sharp corner on the Waiotauru Track 100m south of the Snowy. This runs about 1km up-valley before meeting the river. Heading out the remains of a bridge mark the start of the track. A good well traveled route runs down 'ridge 666' from Elder Hut. Drop north off the ridge about 1km upriver of the forks where the ridge ends. Also accessible from Kime down ridge 594. Added 23 April 2012 by madpommadpom. 1 revision 23 April 2012 by madpommadpom. 446 views in the past year (37 per month).